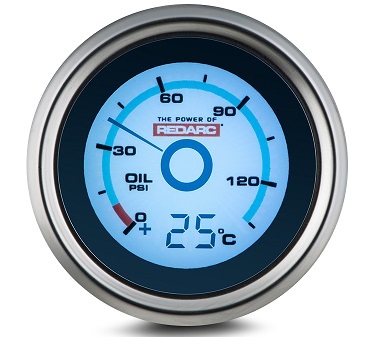 The REDARC 52mm single oil pressure gauge is ideal for monitoring your engines oil pressure. The G52-PT gauge is supplied with one oil pressure sensor from REDARC that displays from 0 to 130 PSI. This gauge is designed to monitor the oil pressure of your vehicles engine. Monitoring oil pressure ensures the longevity of your vehicle and allows you to ensure that the correct pressure is maintained so that your car bearings are well lubricated. This is crucial when travelling at continuous high speeds and towing heavy loads. Low oil pressure can be an indicator of a low oil level, diluted or worn out oil, worn engine bearings, high oil temperature or a worn oil pump. GS-UT-80: An NTC temperature sensor in a plastic housing for measuring cabin, fridge or outside temperature. Range is -20~+80c. This sensor is supplied with a 6 metre extension cable. GS-UT-120: An NTC temperature sensor in a metal copper housing with 6mm diameter mounting hole. Range is -20~+120c. This sensor is supplied with a 6 metre extension cable. GS-OWT1-4: Water or Oil temperature sender. 1/4 NPT threaded. Designed to measure from -20~ +170c. Supplied with 3 metre extension cable. GS-OWT1-8: Water or Oil temperature sender. 1/8 NPT threaded. Designed to measure from -20~ +170c. Supplied with 3 metre extension cable. The G52-PT gauge diameter requires a 52mm hole for mounting. REDARC offer a range of mounting solutions including a 2” black plastic mounting cup (GH-CUP) and one (GH-MP1), two (GH-MP2) and three (GH-MP3) hole gauge mounting panels. Radio inserts are also available that suit the Toyota Hilux (GH-RI05).